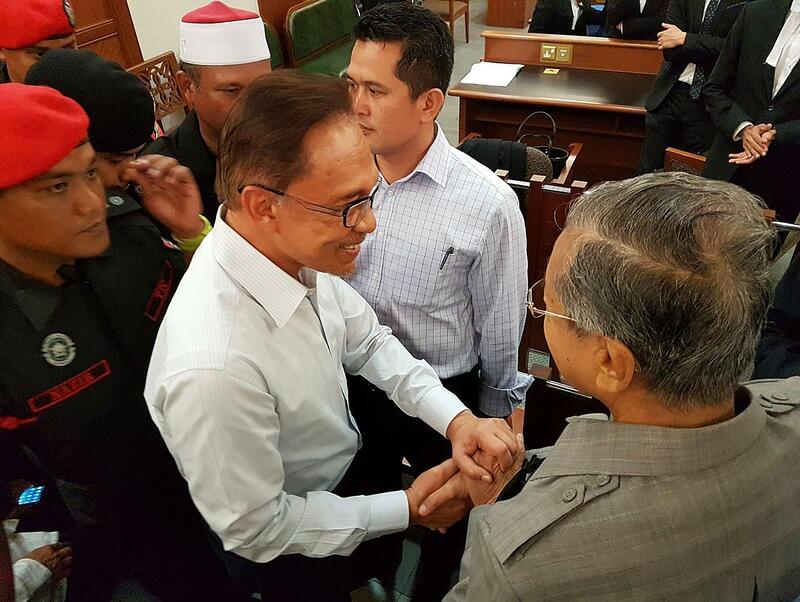 Malaysia’s former prime minister, Tun Dr Mahathir Mohamad, surprised his countrymen by turning up at the Kuala Lumpur High Court on Monday to shake the hand of his former deputy and protege, and (perhaps former) political foe, Anwar Ibrahim. This is a highly significant event, and their short meeting sent a strong impulse through the Malaysian political landscape. Since Dr Mahathir launched a campaign to unseat Prime Minister Najib Razak many months ago, including a national tour that succeeded in collecting beyond its target of a million signatures calling for the removal of the Prime Minister, it had been unclear how far his movement would take him. Or how far he would actually go in getting what he wants. Strange twists in Malaysian politics now see the two figures who were once the two most powerful men in the country becoming fellow travellers with the common ambition of toppling the Prime Minister. The deep animosity between the two camps had loomed as the biggest hurdle to their forces mounting a concerted campaign against the federal government, and threatened to divide the opposition into those who would embrace Dr Mahathir into their camp, and those who refused. It was an understandable divide, given that while Anwar’s supporters wished to topple Umno and not only Mr Najib, Dr Mahathir’s supporters were only out to get rid of the Prime Minister. The opposition parties, though having trouble working with each other, are largely faithful to Anwar and his agenda of national political reformation. No doubt, the grief that the former deputy prime minister and his family had had to suffer since his sacking on Sept 2, 1998, and eventual imprisonment accounts a lot for the sense of loyalty his supporters continue to feel for him. Dr Mahathir’s decision to reach out to Anwar so publicly therefore makes it much easier for his erstwhile protege to consider collaborating with the man who had caused him and his family so much suffering. His Reformasi Movement has after all been the inspiration for the generation of Malaysians from all ethnic backgrounds which now forms the backbone of the opposition. In his dramatic move, Dr Mahathir appeared on neutral ground and over an issue that he and Anwar could agree upon, namely opposition to the National Security Committee (NSC) Act that they both claim gives unlimited powers to the Prime Minister. Anwar was at the High Court on Monday to file an application to challenge the NSC Act, and for once he was not there as the accused. It provided the best occasion for Dr Mahathir to be seen by the mass media and by Malaysians as the initiator of a conciliation, albeit a political one. The public spectacle – and it was of course vital that it should be a public spectacle – of these two once-powerful figures shaking hands almost 18 years to the day since the younger man was sacked by the older man raised eyebrows, caused jaws to drop and sent pundits running to their keyboards to work out what all this will mean. It is too soon after the breakthrough stretching of hands across the chasm to be sure of its aftermath. But given that Dr Mahathir had on Aug 9 started his own party, Parti Pribumi Bersatu Malaysia (Bersatu), saving Umno by getting rid of Mr Najib may no longer be his goal. For Dr Mahathir, since Umno and its network of power will not act against Mr Najib, his fight now has to be with Umno as well. In that sense, the two men’s aims now overlap much more. Bersatu’s potential – and that is why it was formed as a pointedly Malay-based party – lies in it being a reflection of Umno itself. It has a clear strategic goal, which is to attract those Malays who are disenchanted with Umno but who find it hard to accept any system that does not openly guarantee Malay rights. If Bersatu seems able to deliver on that front, it is difficult, if not foolhardy, of Anwar and his supporters to reject Dr Mahathir’s olive branch. Dr Mahathir’s decision to reach out to Anwar so publicly therefore makes it much easier for his erstwhile protege to consider collaborating with the man who had caused him and his family so much suffering. Even for those who are deeply distrustful of Dr Mahathir, it is hard to deny that it was a commendable move by him to heal the rift, even if by just a little. His reasons, no doubt, are tactical, but if he stays steadfast in his claim that the country requires it, the resistance among opposition figures to work with him will definitely diminish. • The writer is the deputy director of ISEAS – Yusof Ishak Institute. His recent books include Merdeka For The Mind: Essays On Malaysian Struggles In The 21st Century.